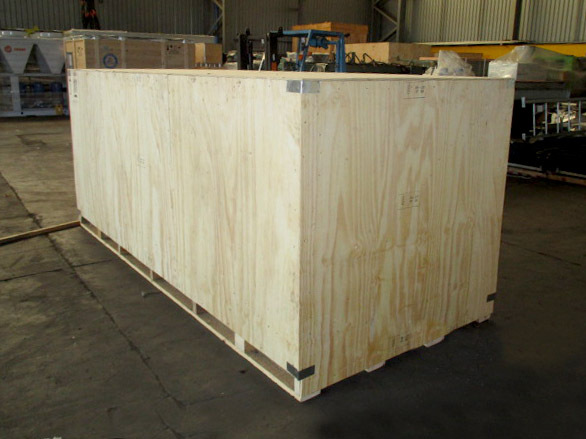 The LOVEMORE BROS Timber Export Crating team designs and fabricates timber crates according to the requirements of customers in terms of quality, size and capacity. 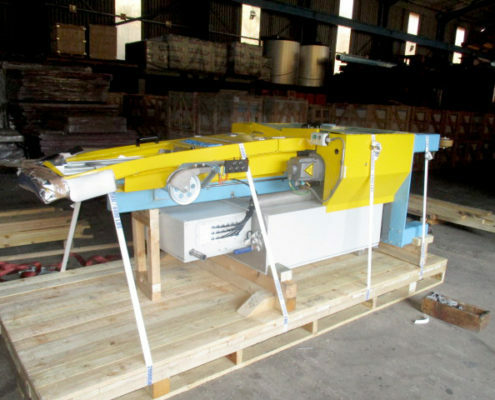 LOVEMORE BROS identified a requirement for the provision of crates for various uses such as the protection of fragile machinery of light weight, high value machinery to be moved and heavy chunky pieces that are too big to fit into conventional containers. Add on services that we offer include rust proofing, plastic covering, shrink wrapping, marking and documentation. 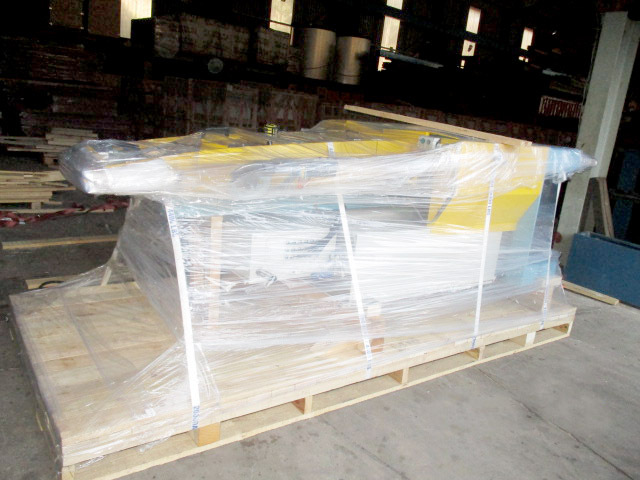 Recently, two control panels were damaged in transit by another transport operator and the Supplier required them to be returned urgently to the OEM overseas. 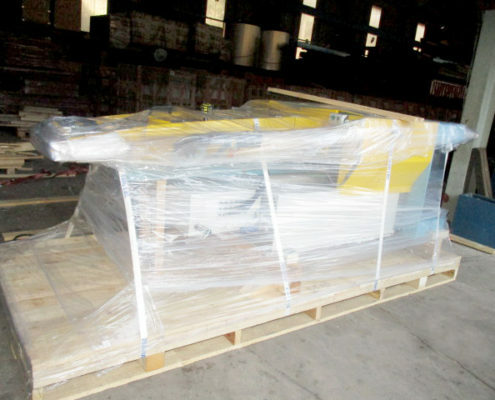 The Shipping option would have taken 6 weeks, and the clients decided to Airfreight the cargo back. 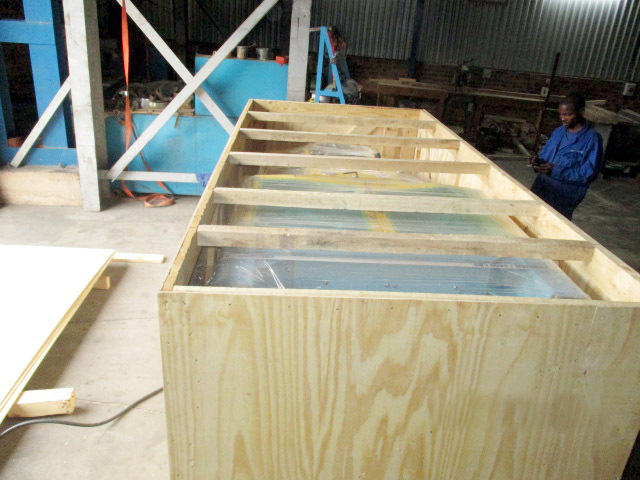 Our crating team took only 3 days to construct the crates and secure the panels. 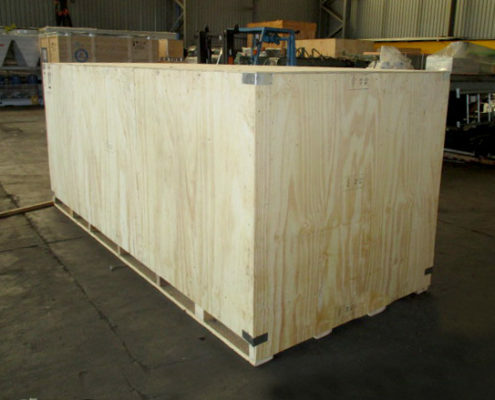 This involved turning the panels onto their sides and fabricating a light weight crate in order to comply with airfreight dimensions regarding the limited height and weight. LOVEMORE BROS is registered and is in compliance with the guidelines of International Standard 15 for Wood Packaging in International Trade. At LOVEMORE BROS we care about the community and as part of our Mandela Day initiative we visited the Bevies Care Centre in Gingindlovu. The Care Centre supports 35 Orphaned children. Bev who runs the Bevies Care Centre showed our team around the premises and we found their needs are great. They rely purely on donations from corporates and individuals. It was amazing seeing the LOVEMORE BROS Riggers interacting with the children and even teaching them a skill or two. 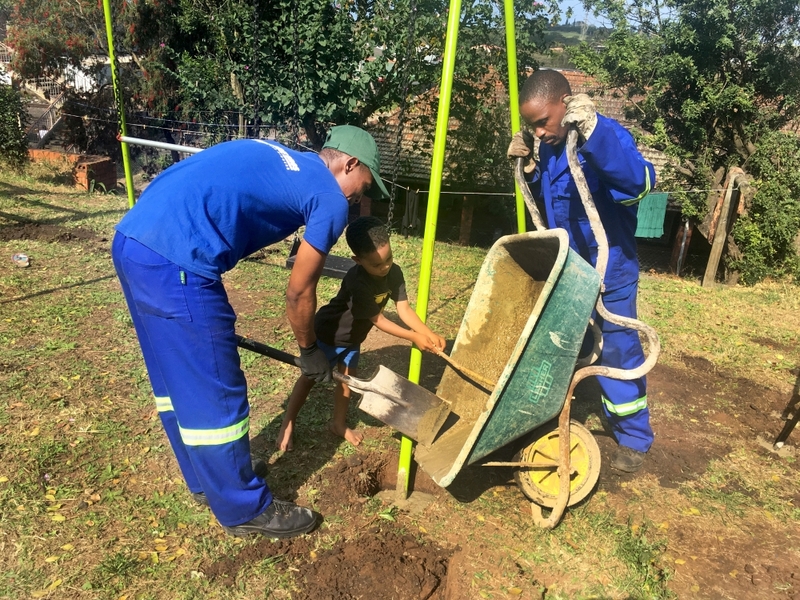 LOVEMORE BROS Richards Bay installed a new swing set and repaired their old jungle gym. The staff kindly donated food and toys for the orphanage. The children were over joyed with excitement and they showed their appreciation by singing to our team. 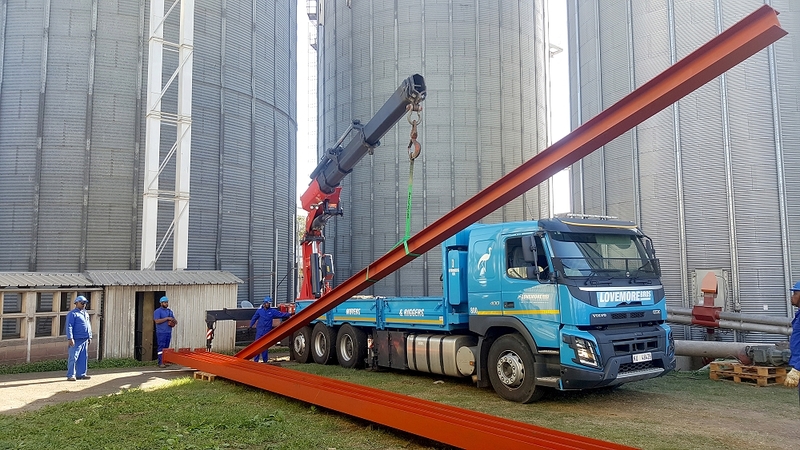 From January to June 2018 LOVEMORE BROS. provided the rigging services and crane supply for the Sappi Ngodwana Lime Kiln refurbishment project. 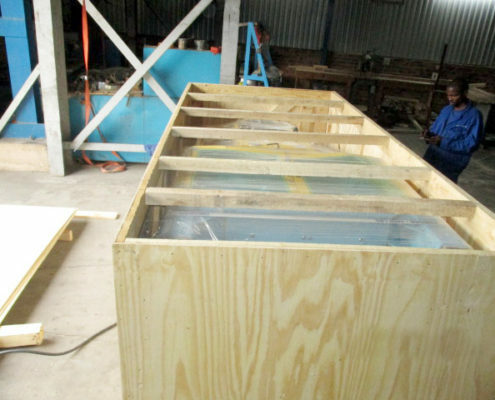 Phase 1 of the project involved the installation and assembly of an Andritz supplied Lime Mud filter with associated tanks and conveyors. Phase 2 moved onto the removal of the 2 x existing lime mud filter units complete, the lime kiln feed end with first 4 mtr section of the lime kiln shell, the ESP air filtration system ducting and finally the fire end complete with cooler, firing hood and burner assembly. Phase 3 then required the replacement of an updated lime feed system supplied by Andritz, with a new feed box system, first section of the kiln shell, air filtration system ducting via a cyclone to the ESP inlet cone, fire end cooler with shrouds, firing hood and a refurbished burner. LOVEMORE BROS. provided a complete rigging service with on site management for the rigging element of the entire project, from concept, receiving of the equipment to the positioning. Equipment required for the project include 600 ton, 400 ton, 220 ton and 80 ton cranes working simultaneously, each manned by a certified rigging crew and supported by a Truck Mounted Crane and forklifts. 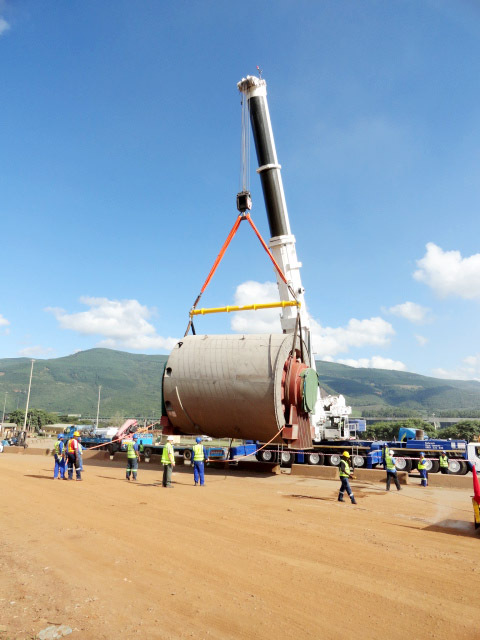 All rigging studies and specialized rigging equipment was supplied in house by LOVEMORE BROS.
As a sequel to the dismantling, loading, transporting and placement into storage of the various components of a 750 ton Liebherr 996 Backhoe from Kathu to Durban, it fell upon the LOVEMORE BROS Lowbed Division to pick up the baton and complete the final delivery of all components to the shipside in Durban Port. With the client focus firmly on minimizing the cost to themselves, it was up to our Managers, Supervisors and Operators to ensure efficient and timeous delivery of each component to the shipside for direct loading, thereby avoiding demurrage charges being levied by the Liner. 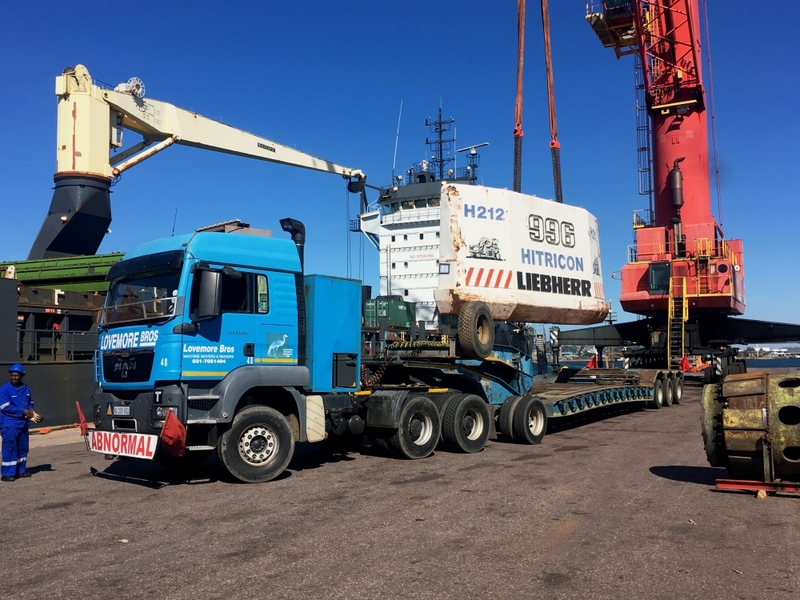 No easy challenge, considering the ship was made ready for loading over a weekend, which is an embargo period for Abnormal Load transport. It took clever logistical planning and astute use of our fleet resources to ensure all cargo delivered without incident on a JIT (just in time) basis. Sadly, our client, lived up to our expectations, and despite numerous promises to cover costs and loud exclamations of appreciation, managed to sneak off without fulfilling his obligation. Give our love to the kangaroos, Charles. 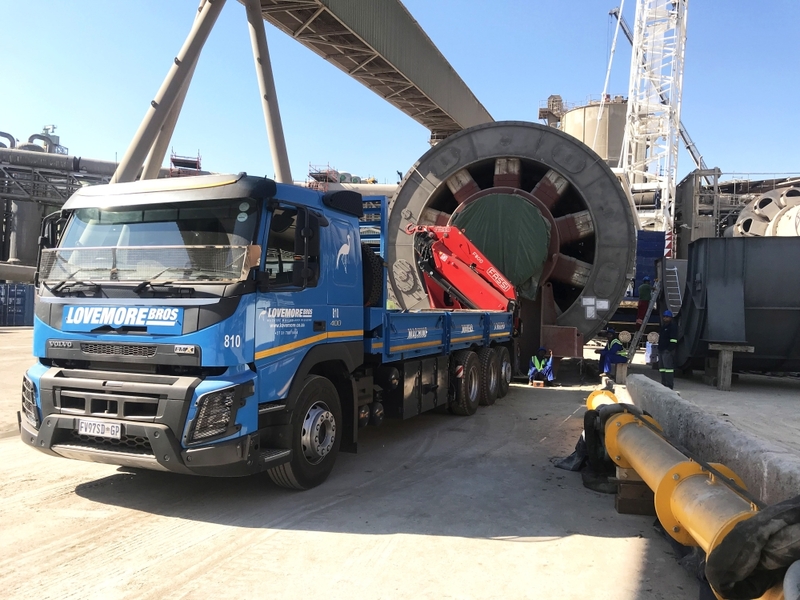 LOVEMORE BROS Durban Rigging Division is the traditional Machine Moving and Rigging business that gave our company the foothold it required to grow LOVEMORE BROS to its current dominant position. 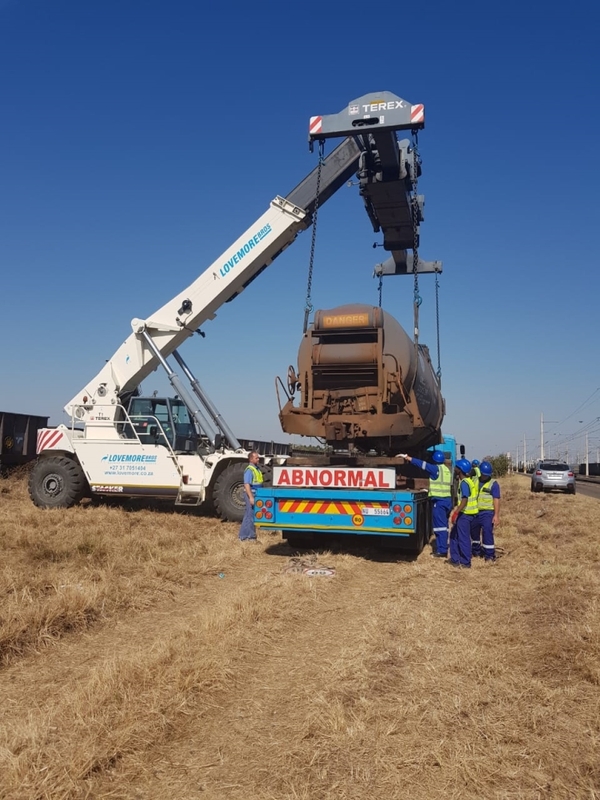 Clients demand and LOVEMORE BROS is committed to continue the high level of service delivery and attention to detail which has always been our standard and desire. Our Durban Rigging Division often handle very intricate details jobs require precision accuracy. 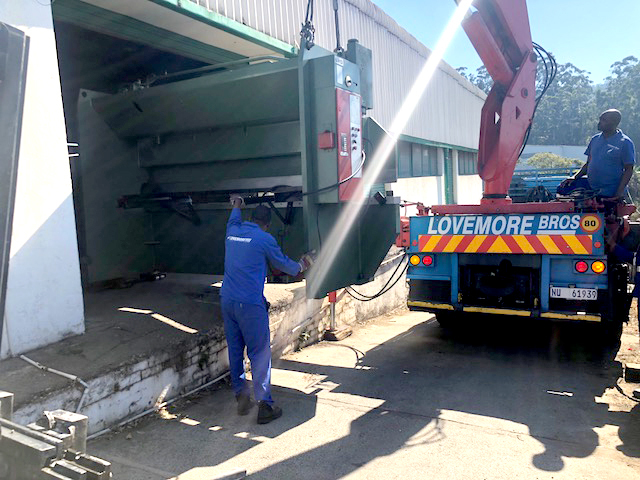 Recently LOVEMORE BROS was requested to offload and position an 8000kg Press Brake from Johannesburg, to Independent Razor & Weld Mesh Suppliers in Westmead, a company that produces razor wire, diamond mesh and weld mesh. 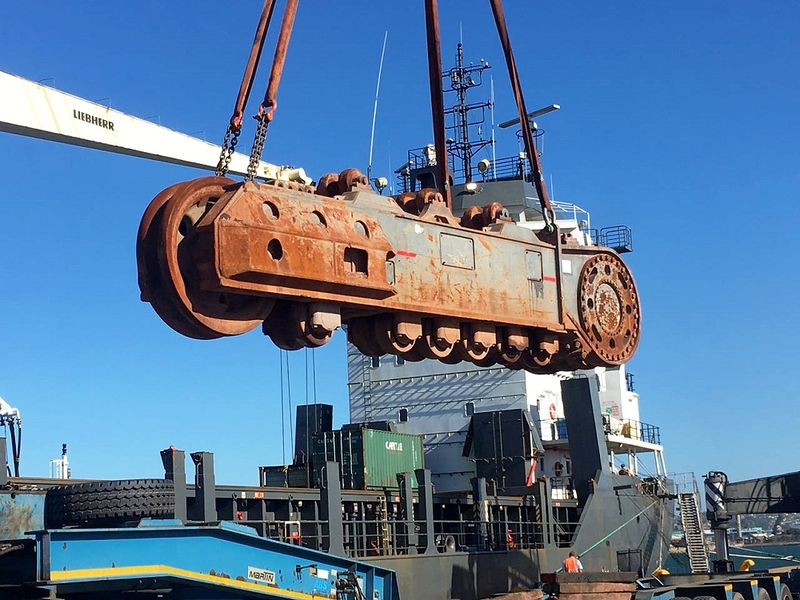 The machine had to be transferred from the transport trailer onto the crane truck deck, which the Rigger/Driver then drove down the driveway to a position where the Truck Mounted Crane could offload it. 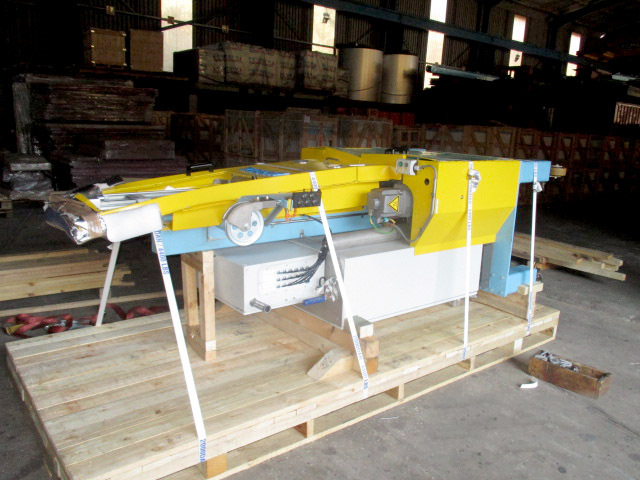 The rigger then rigged the unstable Press Brake in through the small doors of the company premises.